Comprehensive Renewable Energy, winner of a 2012 PROSE Award for Best Multi-volume Reference in Science from the Association of American Publishers, is the only work of its type at a time when renewable energy sources are seen increasingly as realistic alternatives to fossil fuels. As the majority of information published for the target audience is currently available via a wide range of journals, seeking relevant information (be that experimental, theoretical, and computational aspects of either a fundamental or applied nature) can be a time-consuming and complicated process. Comprehensive Renewable Energy is arranged according to the most important themes in the field (photovoltaic technology; wind energy technology; fuel cells and hydrogen technology; biomass and biofuels production; hydropower applications; solar thermal systems: components and applications; geothermal energy; ocean energy), and as such users can feel confident that they will find all the relevant information in one place, with helpful cross-referencing between and within all the subject areas, to broaden their understanding and deepen their knowledge. It is an invaluable resource for teaching as well as in research. Available online via SciVerse ScienceDirect and in print. 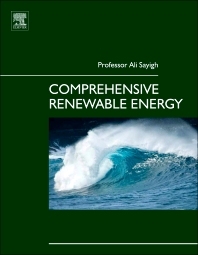 Editor-in Chief, Professor Ali Sayigh (Director General of WREN (World Renewable Energy Network) and Congress Chairman of WREC (World Renewable Energy Congress, UK) has assembled an impressive, world-class team of Volume Editors and Contributing Authors. Each chapter has been painstakingly reviewed and checked for consistent high quality. The result is an authoritative overview which ties the literature together and provides the user with a reliable background information and citation resource. The field of renewable energy counts several journals that are directly and indirectly concerned with the field. There is no reference work that encompasses the entire field and unites the different areas of research through deep foundational reviews. Comprehensive Renewable Energy fills this vacuum, and can be considered the definitive work for this subject area. It will help users apply context to the diverse journal literature offering and aid them in identifying areas for further research. Research into renewable energy is spread across a number of different disciplines and subject areas. These areas do not always share a unique identifying factor or subject themselves to clear and concise definitions. This work unites the different areas of research and allows users, regardless of their background, to navigate through the most essential concepts with ease, saving them time and vastly improving their understanding. There are more than 1000 references from books, journals and the internet within the eight volumes. It is full of color charts, illustrations and photographs of real projects and research results from around the world. The only reference work available that encompasses the entire field of renewable energy and unites the different areas of research through deep foundational reviews. 1.04.1. Harnessing Solar Energy – A New Invention? 1.04.2. What Was the Catalyst for Photovoltaic Development? 1.04.5. Photovoltaics – Where We Are Now? 1.05.2. What Caused the 700× Reduction in the Cost of PV? 1.19.7. Where Is the Junction? 1.35.1. What is Very Large-Scale Photovoltaic System? 1.37.3. Why Put Solar in Space? 1.37.4. Is Geosynchronous the Right Orbit? 1.37.6. Beaming Power to Space: A First Step to SPS? 5.04.1. Why Is There a Trend to Build Stand-Alone Biomass Power Plants? 5.04.2. Is Biomass Power Generation Sustainable? 5.04.4. How Does Biomass Power Generation Pay? 5.04.6. What Technology Choices Are Available? 7.10.6. Geothermal Development in Iceland – Toward SED?